Family Voices Indiana is a family-led organization that provides information, education, training, outreach, and peer support to families of children and youth with special health care needs and the professionals who serve them. 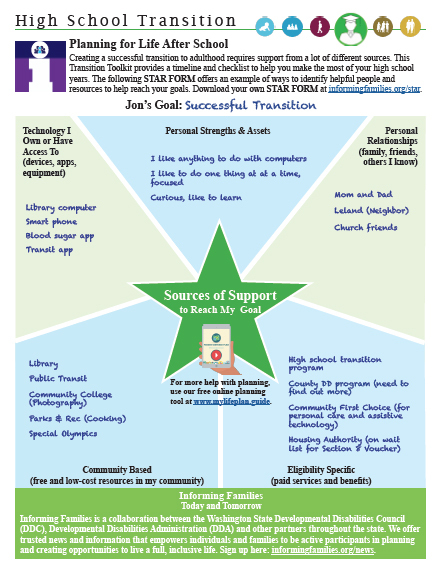 A Star Form to help identify supports to reach a student’s transition goals. Tips for transition planning and goal setting. Transition timeline of things to do from age 14-21. Transition checklist of skills, activities, and services when creating your child’s high school transition plan for his/her IEP. Ways to gain job skills during high school. Available in English and Spanish. Print and electronic format. Click here to order or download your copy. To learn more about the national initiatives of the National Family Voices, please visit the Family Voices website. Follow Family Voices Indiana's board Family to Family tips on Pinterest.